Did you know that Cinnamon induces deep and relaxed sleep? Or that hibiscus is an effective solution to almost every hair problem. and that the smelly garlic can actually help you fight acne!!! If you did know these facts…well a big pat on your back… and if you didn’t…don’t worry even I was not aware that the boring box of spices in my kitchen was like a this big treasure trunk full of beauty benefits. But this changed when I attended the second season of The Nature’s Co Spice Carnival at the Select City Walk in Delhi. India is the world’s leading spice producer, exporter and consumer so basically they are a big part of our life. People are now moving towards more natural way of life whether its food, clothes and even makeup and skin care and The Nature’s Co has identified this. Everything at TNC is absolutely vegan which basically means that their products do not include any animal derived ingredient and are environment friendly . Atmosphere…Inspired from the atmosphere, the oxygenating process of the products in this range feel like a breath of fresh air. Starrize…Inspired from the sun, these products provide nourishment much like the sun. But at the same time, they protect, especially against harmful radiation and its effects. Foressence..captures the very essence of the forest produce, the products carry strong and captivating fragrances and nourishment to replenish the body. Earthborne…Minerals and mud carry nurturing qualities of the soil. Enriching and reviving, the products of this range are truly born from the earth itself. Aquaspark…Inspired from the water, the name brings together the rich aquatic ingredients that hydrate and replenish. Each product range embodies the goodness and appeal of the element that inspired or derived from it. Even the decor of each of the outlet embodies the brands philosophy. The ambiance of the outlet is quite soothing and you feel completely relaxed. To enhance the experience even more, every outlet has this complimentary spa treatments at the personal dedicated spa corner. TNC’s intention behind hosting The Spice Carnival is to help customers enhance their knowledge about various benefits of spices and to basically help them spice up their beauty and in turn spring back spice in their personal lives. The new range of which The Nature’s Co likes to call spicelicious comprises a vast range of 26 products consisting of skin, body, foot & hair care products from radiance-enhancing face creams to a refreshing variety of shampoos, body wash and vitalizing candles all aimed at delivering the healing and soothing properties of spices that both men and women deserve to indulge in after their hectic lifestyle discern. Ms. Rashmi Sarda briefed us about each of the products from not only the spicelicious range but also answered the questions that I had about the other products available in the store. She also shared alot of facts in general about spices and how they can be include in our daily beauty and personal care routine. No event is complete without food…TNC being the perfectionist they are even made sure that the food we were served was in sync with the spice theme…right from the chocolates to the cookies…every thing had spices infused in them. We also had some fun games which actually made me realize how poor my knowledge about spices was but then I was relieved to see that I was not the only one because even my fellow bloggers scratching our heads to answer the quiz. All in all , the visit to TNC was a morning well spent. The whole blogger’s meet was really informative and fun. 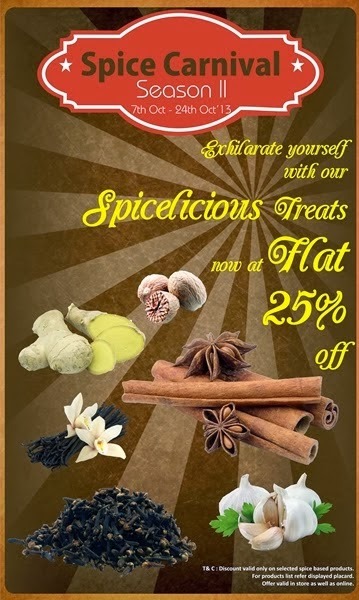 But it doesn’t really end here…..TNC is offering a flat 25 % off on products from the spicelicious range from 7th October to 24th October, in stores and online.